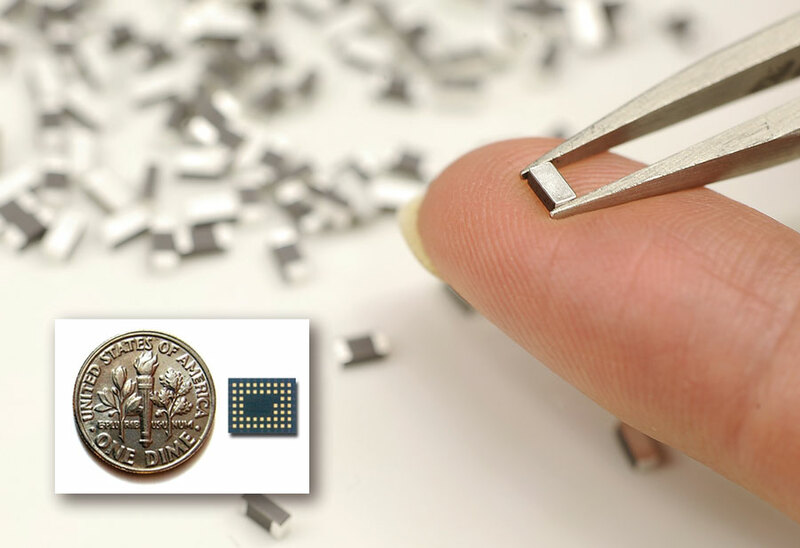 The small chip (shown in comparison to the dime) is a fully functional GPS receiver now integrated into thousands of cellphones. Hook it up to the cellphone’s battery, display and equally small antenna, illustrated, and you’re ready to go. Last month AIN reported on the disturbing increase in reports of GPS interference and deliberate jamming and raised the question of continuing GPS reliability if these incidents (attributable to small portable jammers used by truckers to obfuscate their whereabouts) increase in numbers and transmitted power. We didn’t touch on larger, coordinated cyberwarfare attacks from, say, a foreign adversary, although South Korea has reported these as being transmitted from its northern neighbor. More likely, we can expect local jamming attacks, such as, for example, harassment incidents by domestic insurgent groups against a sitting government, or pirate GPS denial actions in high-density commercial shipping areas, to become more common in certain parts of the world. And since aviation is a worldwide activity that is becoming dependent almost exclusively on GPS and its equally susceptible regional GNSS equivalents, such local, often spontaneous events are growing into an international concern for the aviation industry, including corporate operators. In March, the FAA published an updated 200-page report titled “Concept of Operations for NextGen alternative positioning, navigation and timing (APNT).” The need for an alternate PNT has been part of DOT policy since 2003, when the requirement for a GPS backup was formalized under a Presidential Directive, following the DOT Volpe Center’s 2001 warning of GPS vulnerability to interference. A similar directive was issued for the Department of Homeland Security. Since that time various groups of government and industry specialists have studied the issue, and a wide range of defensive measures have been examined. The current report brings the final conclusions and equipage recommendations (in the field of electronics, of course, there is never a final solution as long as engineers continue to develop new concepts). In this case, therefore, the FAA document is offered as a solution to specific NextGen needs out to 2025, and some unspecified period thereafter. Essentially, the FAA APNT group proposes that the primary GPS backup be scanning DME, preferably supported by onboard inertial reference systems, and assisted in places by low-powered GPS-like pseudolites and wide-area multilateration. This is seen as a workable combination, and the National Airspace System (NAS) could continue to function with it, albeit at much lower efficiency and the risk of extensive delays, particularly in high-density airspace, and in adverse weather conditions that dictate extensive radar vectoring. And, of course, individual aircraft equipage would determine the probability of mission completion. That is, a DME/DME/IRS-equipped aircraft could have reasonable success in mission completion, and one with DME/DME but without IRS would have only a slight disadvantage. Unfortunately, in a GPS failure event those without DME/DME could only fall back on VOR for navigation. Some aircraft, of course, still carry single DME, installed before the FAA decreed that with the coming of GPS, DME was no longer required, and these would be useful. As for VOR, the FAA has already decided to drastically reduce their numbers, to a minimum operating network ensuring that, when cruising above 5,000 feet agl, an aircraft should be able to receive at least one VOR within 100 miles. The new report provides a detailed analysis of how the variously equipped–iDME/DME/IRS, DME/DME and VOR–aircraft would operate in the different phases of a flight, from being parked on the ramp, to taxiing out, taking off and continuing through each consecutive phase to being parked at the destination. The analysis is performed for two routes: one goes from an unspecified location to Miami International, and the other goes from the unspecified location to the mountain-ringed airport at Hailey, Idaho. Unquestionably, the procedures described are correct, and perfectly safe, and would probably be self-evident to the more experienced pilots flying better equipped aircraft. For the VOR-only pilot with only modest flight experience, the procedures could appear pretty daunting. Also, of course, there would be the need to have individual written procedures for every airport presenting any complexity, reminding one of the handwritten notes and sketches that Capt. Elrey Jeppesen made for his mail flight colleagues in the 1920s. Does the FAA report reflect future reality? Will its parent Department of Transportation be inclined to invest money in building a unique NextGen aviation PNT infrastructure, which includes, according to some industry experts, installation of at least 50 more DMEs and the upgrade of many others, along with the re-siting of many VORs? And are corporate operators and U.S. airlines with overseas operations ready to invest in the DME upgrades that some feel would be necessary? Surprisingly, the FAA report does not mention costs, which appears to be a serious omission. This is where the FAA appears to be looking at the problem through the wrong end of the telescope. We have all probably seen the pie diagrams that show the relative sizes of the GPS user community. Aviation owns a pretty slim slice of that pie. By far the largest segment is in vehicles and other surface transportation modes, including commercial shipping, followed by cellphones. And in most of the world outside the U.S., including Europe, the local aviation slice is even thinner. Consequently, major investment in a unique PNT solution for one small segment of a region’s total GPS community would be hard for governments to justify at the best of times. The conclusion seems to be that any GPS/GNSS backup will inevitably have to be multi-modal, unjammable, provide GPS-like timing, have signals extending from the ground up to all altitudes, be unaffected by line-of-sight restrictions and, preferably, have reasonably long range to keep down the number of transmitting stations required. In the current absence of any other demonstrable technology, eLoran meets all those requirements. Unfortunately, many believe that Loran dropped out of sight in the late 1900s when, not surprisingly, it was superseded by GPS, just as NDBs were superseded by VORs, which are themselves now gradually fading away. The big difference is that Loran engineers continued to develop the system, overcoming the aircraft precipitation static problem and, more important, moving from the previous regional “chain” configuration to a GPS-like “all in view” deployment where eight to 10 strategically located transmitters could cover the entire U.S. at RNP 0.3, which in turn can be improved upon by Waas-like differential corrections. The only thing that eLoran lacks is a vertical component, so it is limited to non-precision approaches. But as a backup in a GPS outage, RNP 0.3 would be adequate, And, currently, there are no eLoran airborne receivers. In fact, there may never be a “stand alone” eLoran airborne receiver with its own controls, since electronic integration in avionics has steadily moved away from black boxes dedicated to individual functions. Consider that a tiny chip smaller than a dime serves as a fully functional GPS receiver now integrated into millions of cellphones. Hook it up to the cellphone’s battery, display and equally small antenna, and you’re ready to go. Could eLoran become the recognized GPS backup? It’s possible, but the fact that its predecessor, the long-running Loran-C system, was cancelled by non-technical federal bureaucrats against the strong recommendations of technical specialists, including GPS leaders, could make it a politically tough sell. Foolish as it sounds, maybe the first move would be to find a substitute for the Loran part of its name. Yes, jamming is a real issue, I've experienced it myself years ago. Just recently, jamming was experienced in Asia and created problems for commercial air carriers. In today's world of terrorists and military adversaries there will always be 'hostiles' that will deny the use of GPS, one of mankind's greatest achievements. Hence there will be the need for a back-up or warning systems in life critical applications. This situation has been know about for many years and should have been addressed years ago. But, anything that increased cost and delayed schedule was met with opposition. The key is whether another level of complicated specifications, procedures and equipages will further confuse and limit true progress that facilitates a seamless aviation CNS environment from gate to gate. Personally, any back-up system should be at least as capable as GPS, albeit not as accurate as enhanced GPS, that is: geo-referenced 3-D position, 3-D velocity and precise time. Putting in 2-D back-up makes no sense at all. Unfortunately, for everyone, this will not be a simple or cheap deployment, unless the FAA rides on the coattails of the mass communication and positioning markets. I am biased towards LORAN. In 1970 we were dropping bombs in a very small CEP targets with F-105's and LORAN-D at the Tactical Air Warfare Center at Eglin AFB. (T-Stick II Program) eLORAN with DGPS and DLORAN corrections would be as accurate as LORAN-D. With monitoring stations adjusting for the velocity coefficient of the earth and going from Hyperbolic to Rho-Rho (DME-DME) and UTC synced pulse will greatly enhance the equations. Modern DSP chips and FFT will increase immunity and the "H" field (last improvement to Omega) will reduce P-Static interference. Dr. Lilly demostrated that years ago at Ohio University. I could go on, but this isn't your fathers interference prone LORAN-C. Reference to Jamming LORAN-C. It is extremely if not impossible to Jam a 1 Megawatt Pulse from a mobile antenna. Just the radiation efficiency at 100 khz from a short antenna would not radiate at all. Then giver the Square Law calculation, I doubt any one could detect it at 20 miles away. So the Point is it is a backup. I used it in my car all the time until they shut it off. Oh ya, 3D. We use Altimeters for RVSM right now. And lets remember the decent tables for airspeed and stop watches in the cockpit. Verticle profiles with altimeters and even radio altimeters are not that hard. Having maintained CAT III ILS's (ground) and being certified on B7X7 aircraft for Avionics, CAT 1 or a non-precision approach is not that hard. Besides, if you co-mingle the GPS information with the eLORAN the result gets better for eLoran until the GPS gets Jammed. It sure would be better than Doppler Nav, Omega or Celestial Navigation or less costly than a Ring Laser Gyro Inertial Platform.........A Little Humor. Curious who makes the GPS chip and antenna shown in the figure. Thanks.